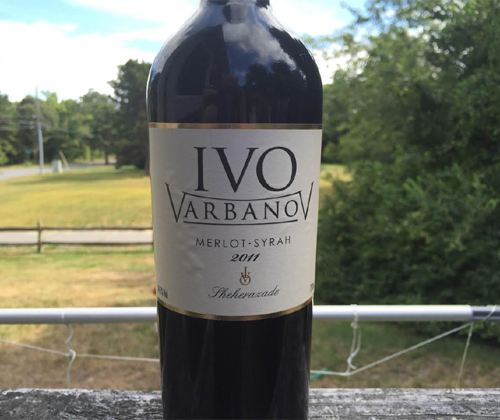 This is the first of six reviews of Bulgarian wine this month, and the first of three by Ivo Varbanov. Those wines by Ivo are this 2011 Merlot-Syrah "Sheherazade", his 2013 Chardonnay "Clair de Lune" and his 2011 Syrah "Feux d’artifice"
The wine is 80% Merlot and 20% Syrah. Both were fermented in stainless steel but the Syrah spent some time in French oak barrels after fermentation. Filtering and fining is minimal. Of course I'll be listening to the song while I taste this wine. These bottles have a great, classic label design and an awesome wax covering on the neck. It's not easy getting the wax off of the cork but it's all good. The color of the wine is a dark, dark crimson. The nose has plum, black olive, dried tobacco, and a graphite minerality. It's medium bodied with a chalky mouthfeel, firm and bitter tannin, and balanced acidity. The palate is fruit forward with plum and cranberries, and side notes of cedar and graphite. It finishes with a light taste of plum and bitter, cedary tannin. It's a delicious bottle of wine that hits its $15 price point right on the head. I'm not sure if giving it some more bottle aging or a good decant will fix the bitter cedar flavor on the finish, but you can try it. Or pair it with cheese to cut it down.